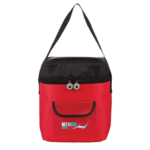 Promotional Bags are very popular no matter what the season as the range covers a wide range of applications from everyday usage backpacks to bags for the weekly shopping and use at seminars and exhibitions. No matter what your budget or promotion we are sure that we will have the right bags available in the quantity and style you need. We can also handle all the artwork for you and make sure your printed bags are delivered on time and exactly where you need them. According to the British Promotional Merchandise Association (BPMA – https://www.bpma.co.uk), promotional bags are one of the top 10 products when it comes to marketing campaigns and Redbows supplies one of the largest ranges in the industry. As well as being highly practical and useful, they are a great way to promote your log and message to everyone who comes into contact with it. Our range includes bags to suite any budget and we can also supply them as plain stock products if required. As well as for specific events including sports, exhibitions and conferences, we also supply shoppers which are becoming ever more popular as retailers charge for plastic bags and shoppers become ever more environmentally conscious. Our shopper range includes ‘bags-for-life’ cotton, canvas and jute versions, as well as more traditional paper ones, all of which can be personalised and printed with your logo. Some of our bags are ideal for school, college and university promotions. Drawstring bags and rucksacks can be ideal here and can be personalised and branded using a variety of techniques including screen prints, heat transfers and embroidered imprints. We can also bundle these with other promotional items including personalised clothing or with items including promotional stationery, pens, pencils, USB memory sticks and mugs or ‘freshers’ week kits. One of the key benefits of using bags in any marketing campaign is that they are highly functional and will be re-used many times by the recipients. Often bags are kept for at least a year or more and so can help to benefit the environment through their re-use. For an even more reduced environmental impact we also supply eco-friendly bags made from bio-degradable materials which are farmed and cultivated from sustainable resources. Eco-friendly ‘bags for life’ are becoming more and more common with many people now turning against plastic shopping bags which are not bio-degradable and therefore damage the environment. According to the Environment Agency (https://www.gov.uk/government/organisations/environment-agency) bags made from natural materials have a 25% lower carbon footprint than traditional plastic bags and this can be even more the longer the bags are kept and re-used. The Redbows promotional shopper bag range is extensive and we also offer custom and bespoke bags made to order allowing clients to completely be in control of the design, shape, material and colour. Quality, speed of delivery and order efficiency are aspects we use to differentiate ourselves from the competition. A selection of our bags is available on express delivery timescales. A typical bag order may be available within 10 working days from artwork approval (sign-off). With our express delivery bags, we can meet very short lead times of within 1-2 days for single colour, one position prints. Budget: unit price branded with your logo will be important. Additional costs to consider here include those related to delivery and distribution costs which will be bag size, volume and weight related. The imprint method will also affect unit costs with screen printing or heat transfers offering lower cost solutions compared to more expensive embroidery. Areas: bags differ in terms of the imprint are they offer. Shopper bags for example can include a large area on the side panel. Rucksacks may include a smaller area and the imprint may be an embroidered area or sewn on or stuck on motif. Colours: it is important to choose a bag colour that will provide a good background for your logo. It may be necessary to go for a reverse/negative of your logo to get the full impact. This is generally considered to be a white version of your logo to place onto a dark background. Functions: bags carry items and materials but it’s important to make sure you choose bag that is right for the purpose. 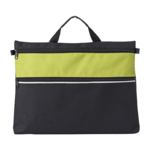 A shoe bag is ideal for golf shoes, a drawstring shoulder bag may be ideal for sports or swimming kits and a messenger bag for conference documents. We pride ourselves on the number of successful promotional bag projects we have been involved with over the years at Redbows. We are confident that we can help with yours, no matter what the size or scale. Please contact us if you need any assistance on 0800 158 3080 and we will be only to happy to offer advice and help you get the right bag for your promotion. Do you know we offer a wide range of printed bags? We offer such a wide range that sometimes it is not easy to make a choice as to which product will be right for your campaign. We therefore provide free samples of printed bags from previous marketing campaigns. This can help show not just the quality and size of a material but also print quality. Our in-house design studio always generates virtual visuals. This will show you how your logo could look on any of these products. It doesn’t matter if you don’t have printer ready artwork. Just send us your logo and our design team can import this into their design software and superimpose this onto a product for you. Our design team can also convert this into the vectorised artwork file we need to print your order when you are ready. 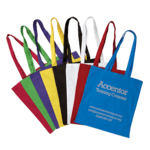 How do you receive your promotional bag quote? We provide quotation via our web-based system and you can then view these online, download for a local print and accept or comment on them online. We also accept web-based orders via our website checkout and you can also upload a vectorised artwork file at time of order if you have your own. All lead times are quoted from artwork form acceptance and sign-off. If you need a fast delivery service let us know. What material is the most popular in bags? Cotton is the most popular product material available for branded bags due to its long lasting durability and low cost. They’re strong enough for everyday use or for carrying your shopping around and can be used again and again. If they get dirty, the material is washable, so you can simply put them in your washing machine with the rest of your laundry. If your looking for bags on a budget Cotton is the material to choose. What are your most popular promotional bags? In bags one of our most popular products is the Cotton Shopper. It remains one of our bestselling products due to the large print area and variety of printing techniques to choose from. Sometimes, simple really is best as this product is more likely to be used in everyday life either while shopping or out and about. That continued use is what’s going to effectively convey your message to clients. Why are document bags useful? Personalised document bags are an excellent choice for schools or universities. The bags offer excellent print areas on the front or back of the bag and are really useful for organising children’s paperwork and school books. We offer a variety of styles and colours to suit your brand. Simply select your product and contact us to order.